Part 4, covering the period March 2007 to September 2008, can be found here. Well I talked to a gal at the local "Back to School" Barbecue who teaches international economics at PSU and asked her point blank if Prince Andrews efforts to promote trade really make a difference. And being a Professor, she really hadn't any idea at all and just about less of who Prince Andrew was. . . . 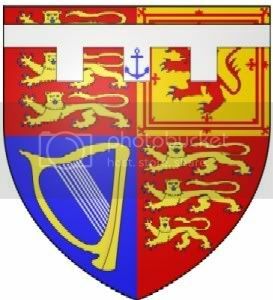 Anyway, Warren, since you know EVERYTHING, did PA design that coat of arms himself or was it already the House of York's arms or what? Thanks! Coats of Arms are designed (devised) by the Royal College of Arms. The above is actually the shield from the full Arms. It is the standard royal field (as in my avatar) differentiated by the banner with the anchor to denote the Duke of York. Prince Andrew would have had some input into what he wanted in the banner. Ulsan, about 410 km (255 miles) southeast of Seoul, Sep 30, 2008. Very nice, Ice. (I like the sound of that) P. Andrew looks dashing and quite intent. Thanks again, Ice. Any pics of P Andrew are always welcome in my book. Seems he's focusing alot of his visits to the Asian market. British and South Korean businessmen at a hotel in Seoul Oct 2, 2008. Up close and personal pics! You're The Best, Ice!!! How cute. Oh dear...a double chin...not his best angle, I'm afraid. Asia seems to be where the money is. He's not golfing enough. . . .
And yes, Maid, we ship more money over there every day. HSBC Bank is Hong Kong Singapore Bank of China. They do very well over here in the states. . . .
How adorable! I esp. like the ones w him and the children! Thanks, Ice. Bella! You beat me to it! I was going to say "Thanks Ice! I'm sure Bella will appreciate these!" Boy I'm slow on the draw today! My he got home from Asia rather quickly, didn't he? I bet he got in a game or two somewhere! My favourite prince! I don't care how much golf he plays or how many Airmiles he accumulates--I like him! I like that picture of the little girl with her hand almost touching his arm. Cute. Indeed, Prince Andrew is the handsomest Prince. He is like French cognac ... becoming better with age. Seriously speaking, this is the first time I see Prince Andrew performing non-foreign non-business-related engagement.